The Kabuki-za is a fancy-pants theater in Ginza for the screening of Kabuki- a highly stylized and traditional (read ‘boring to most people’) form of storied stage performance. 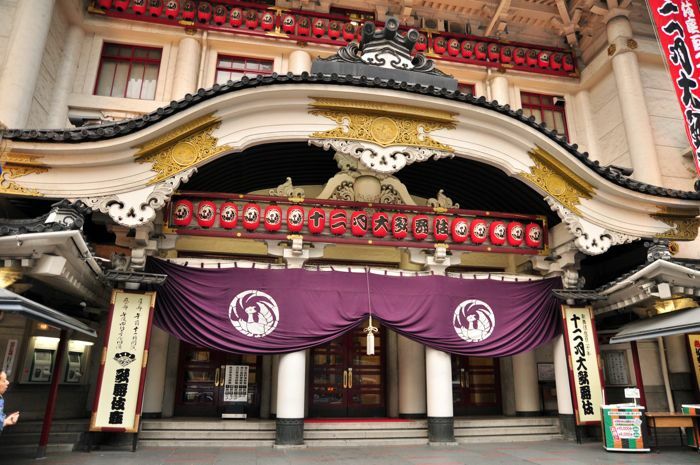 The Kabuki-za is famous as the principal theater for this kind of show in Tokyo- with a long and varied history dating all the way back to 1924. I’ve been to Kabuki once, at this theater, around 5 years ago. As with sumo, I found the whole affair terribly dull and uncomfortable. As with sumo, I think the only way to appreciate Kabuki is to gradually, over years, inure oneself to what at first seems like dullness but upon reflection is revealed to be centuries of intricately refined and re-refined practise. Sumo is a long haul sport, like Test Match cricket; tuning in to watch for a few hours will have little meaning and not be especially interesting, whereas keeping an eye on the whole multi-day affair and watching strategic matches in bite-size gulps can be intensely exciting. Kabuki is an even longer-haul. You need to watch the extreme long game, going back decades, centuries even, back to the days of the Floating World when it really got up a head of steam. Most young Japanese have not been to Kabuki. It is a relic, fossilized- the settings always medieval, the stories and themes always revolving around the same traditional aspects- honor of the master, duty to family and feudal lord, self-sacrifice, doomed love. It’s generally very bleak stuff. Add to that the extreme ritualisation of every movement and action designed to slow the flow of the story, archaic language, and story structures we would not recognize as ‘stories’ in the West, and you’ve got a recipe for falling asleep. Though they do the best they can to keep you from sleeping, as all the chairs are incredibly tight and uncomfortable. If you have long legs, it’s doubtful you’ll even be able to fit. 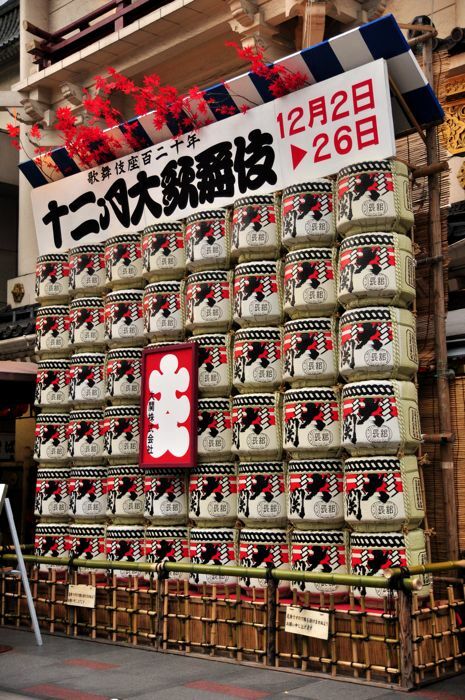 These are old wine or sake drums, stacked up to celebrate something or other. 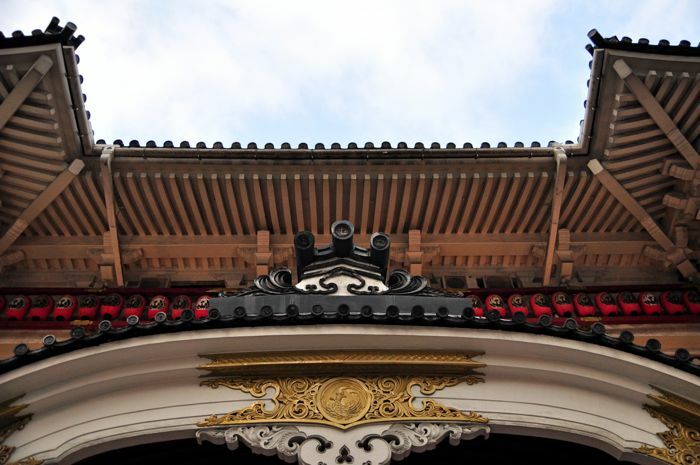 The Kabuki-za was intended to come off both Baroque and similar to a traditional Japanese castle. This heavy tiled and carved roof contributes to both impressions. 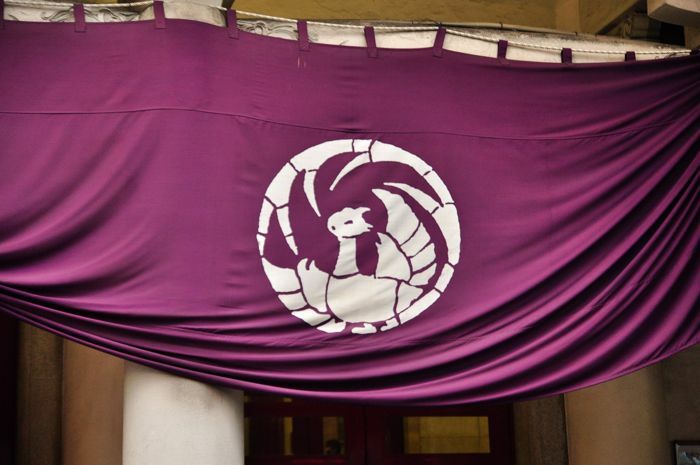 The Shochiku crest- the only family/company of actors who perform in the Kabuki-za. Entry – Every day there are shows, entrance price varies, from around 4,000 yen upwards. Facts – 1924, before that 1889. Highlights – Railing against kabuki. Hiya, Michael. I had to chuckle at the honesty of your assessment of Kabuki. I’d love to here what you think of Noh! We were treated to a show at Kabuki-Za by my one of my wife’s NHK friends during our last visit, back in November. I had read about the demolition of the theatre and decided we needed to go, as it would be history by the next time we got to Tokyo. At first I was shocked at the nonchalance with which Japanese tear down old things, but perhaps in this case a new theatre might spark a little fresh interest in the under-70 audiance. I’m a little more sympathetic to the Kabuki form, I guess. I’m especially impressed with the art of “Mie,” which literally freezes a climatic or highly emotional moment in time, like a panel from a vintage Ukio-e poster. But you’re right. Too much of (what is left) of traditional Japanese culture is preserved in formaldehyde. Very dusty and musty. . . Have you read Alan Booth’s books? I just finished “Searching for the Lost.” He came over back in the 70s ostensibly to study Noh, and comments a lot on this “preservation” phenomenon. Gavin- Ah, good call, I meant to mention that in the article, thanks for noting. I got into Alan Booth randomly while searching for more books similar to Alex Kerr’s ‘Dogs and Demons’, which blew my mind. I have since read Kerr’s first book- ‘Lost Japan’, and that’s what partly fuelled my appraisal of Kabuki. Basically- the whole book felt like a watered down version of the one to follow it, lingering unduly on and giving too much weight (in my opinion) to discussions of art and ‘literati’, basically bunches of layabouts smoking cigarillos and trying to one-up each other in decadence and niche-knowledge. Compared to the meat and bones of ‘ Dogs and Demons’, it’s a book full of soft and flowery sentiment. I’ll have to try Dogs and Demons. I read Lost Japan, and agree with you on that one. I got nothing from it but extreme annoyance. Re: the the Alan Booth book, he makes more pointed observations about Noh, etc. in the very last chapter. I’m glad you’re reading it. I think you two share similar sensibilities. It’s not a page-turner by any means, but a very satisfying book. Too bad he didn’t live to write another.